Enjoy the delights of sinfully scrumptious American crabs recipe. Read them all and learn how to make American crabs. Crab Stuffed Mushrooms is a very popular recipe. 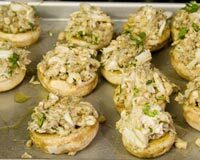 Learn how to make/prepare Crab Stuffed Mushrooms by following this easy recipe. Cold Crab Dip is an excellent way to start your lunch. Learn how to make/prepare Cold Crab Dip by following this easy recipe. Treat your friends to yummy Crab Fondue. Learn how to make/prepare Crab Fondue by following this easy recipe. Hot Crab Dip is a terrific sauce, perfect for seafood lovers. Learn how to make/prepare Hot Crab Dip by following this easy recipe.